This month I’m doing a 1st grade unit on stories without words, and it’s wildly successful. This is the perfect time of year for it; all the kids and teachers have spring fever, and this is creative and low-stress. I let them tell me the story, and I just ask endless questions to get them talking (“Where do you think they are? What’s happening outside? Does so-and-so look happy or sad?”) I’m reading several books with the kids, including Barbara Lehman’s Rainstorm and Sara Varon’s Chicken & Cat. 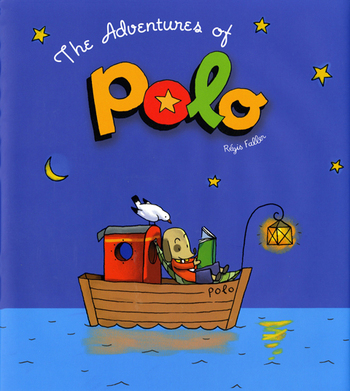 But I have to talk about the complete and total magic of Regis Faller’s Adventures of Polo. It’s a French book that I fell in love with when I first read it last year, and I still adore it. And I was dead wrong about it being too long for a program or lesson. It doesn’t take nearly as much time to read as I thought, and while it’s longer than many picture books it keeps children positively riveted. I think it’s hypnotizing.